PEMS ProLogix™ is a full-featured, predictive emissions monitoring software system that meets EPA Performance Specification 16 (PS16). Owners and operators can use PEMS ProLogix to monitor emissions from boilers, turbines and SI or CI engines. PEMS ProLogix™ calculates pollutant emissions with CEMS-level accuracy, eliminating the need for calibration gases and hardware preventative maintenance. The results are low operating costs and increasing reliability. The results are low operating costs and increasing reliability. PEMS ProLogix™ delivers real-time emissions data over your Ethernet/IP networks for the highest system visibility available. PEMS ProLogix™ provides a software monitoring solution for your emissions compliance and process measurements of combustion sources under 40 CFR 60 and 40 CFR 75 Appendix E. AMP-Cherokee offers PEMS data monitoring and maintenance plans that include RATA and quarterly RAA tests for maximum system reliability and optimal cost effectiveness. PEMS ProLogix™ uses a statistical model to provide real-time emissions data from a wide range of operating input parameters with CEMS-level accuracy and reliability. Real Time & Historical Displays. PEMS Reporting Suite. PEMS ProLogix™ features real time and historical trend displays. 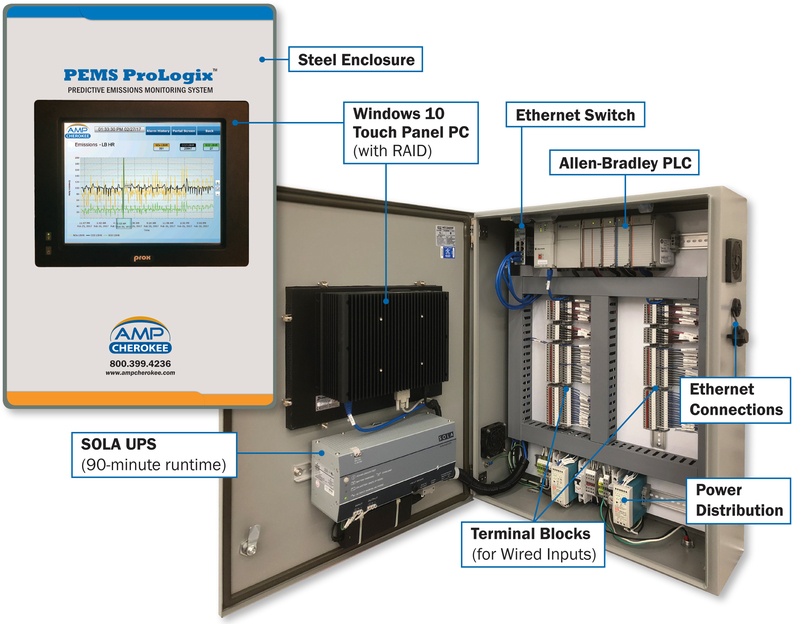 For full-featured regulatory reporting (and additional data security), add AMP-Cherokee’s DAS ProLogix data acquisition software. With PEMS ProLogix™, data redundancy is provided at the PLC and polling computer (if equipped) prior to distribution to Ethernet/IP-based networks. Data transfers that are interrupted by network disconnections are automatically restored to all servers. PEMS Remote Operation. Alarms and Notification. PEMS ProLogix™ monitors system health status. Email alarms can be configured across your monitoring network. Remote access provides administrator level operation of controls and troubleshooting tools. 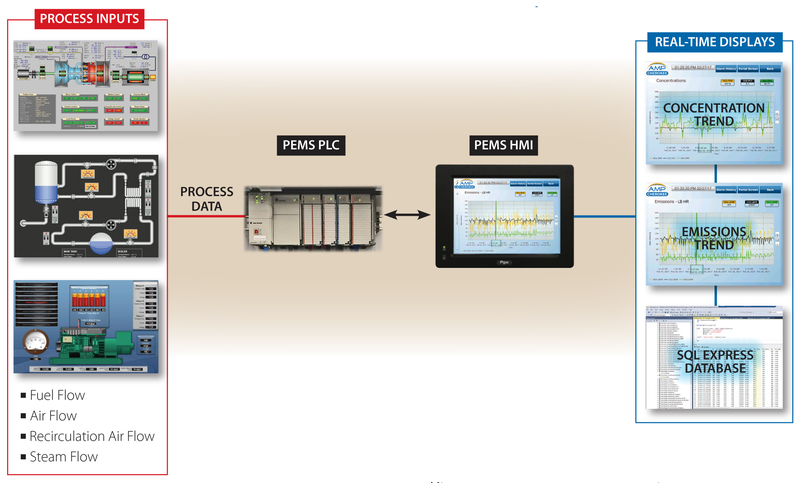 The PEMS model will be able to accurately predict NOx, O2, and CO2 for emissions across all loads and operating scenarios with as few as three sensor inputs or with as many as fifteen sensor inputs. A fourth order polynomial model will be created for each sensor input. In this way, the accuracy of the predictive model can be evaluated for each individual input sensor thereby establishing it’s predictive relative accuracy compared to the other sensor inputs. In addition to developing the PEMS model, AMP-Cherokee will also create a sensor input validation model which will be able confirm the validity of a given sensor input based on it’s relative value in relation to other sensor input values. After the predictive emissions model and the sensor input validation model have been completed for each boiler, AMP-Cherokee will conduct a bench trial in which historical data is used to evaluate the PEMS model. In this way, engineers can make final adjustments to the PEMS model prior to deployment thereby increasing it’s accuracy.